There are countless restaurants in China Town, but one of the most famous is the Wong Kei at 41–43 Wardour Street. 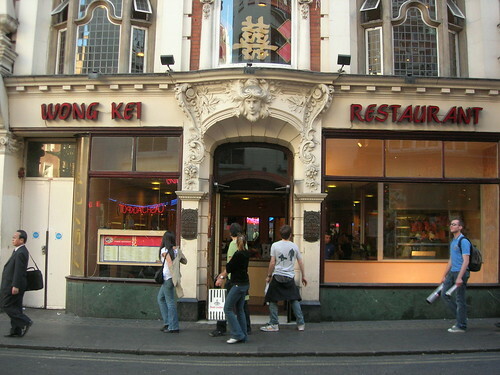 The Wong Kei is apparently one of the largest capacity Chinese restaurants in the UK. Memorable for it's cheap food and brusque waiters, the Wong Kei is certainly a distinctive establishment and the building itself was once owned by Willy Clarkson, a famous theatrical wig maker. It's certainly one of the restaurants in the area with the biggest reputation, beginning on arrival, when you will be seemingly randomly allocated a floor to report to to be allocated a table (really all based on group size). Once you arrive at your table the service remains brusque and almost rude, which is part of the reason for it's cultish reputation. The food is good though, and cheap too.